The Detroit News reports: Honda's most luxurious Civic wagon goes fast, with small-car finesse. The Detroit News gives full chublove to the 2007 Honda CR-V. And you know what? We can't disagree with 'em. The CR-V has moved way upscale compared to it's predecessors and it's now far more refined. To the point where you can really question the need for something more luxurious in this class. So, if you need a Civic wagon that gets crappier gas mileage just so you can see over the car in front of you, this is a smart move. Oh, Honda. You and your silly engines that spurt out stuff and make other stuff not work! Crap, this recall affects a crap load of cars and trucks -- but not the little Civic that can! Or the Fit. It's interesting to note that Honda has a big recall in China, too. So, in total, the recall stands around 700k. Anyone think it'll go to a million? Anyone? That's a snap of a gussied up Civic. Unaffected by this recall. So far. 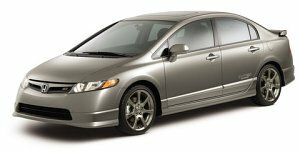 [Honda] also expressed skepticism about prospects for plug-in electric hybrids. Even if dramatic improvements are made in batteries for plug-ins, he said, motorists would not save enough in fuel to justify the vehicle cost for at least six years. Ha! You see, Honda doesn't do E85 or have plans to make a plug-in dealie. [Honda's] views contradicted those of the other automaker witness: Beth Lowery, General Motors' vice president for energy and environment. GM is a major proponent of E85. It also has unveiled a concept vehicle, the Chevrolet Volt, that would be a plug-in electric car equipped with a small engine to recharge batteries. Lowery said government should help expand the availability of alternative fuels such as E85 and should spend taxpayer money on battery development. First, VP for energy and environment? The company that makes Hummers has a VP of the environment? Man, we just love the auto industry. Second, we should pay for battery development for GM to sell back to us? Let's check the bullshitometer.... DING! DING! DING! Honda sure seems to be the greenest company overall in terms of fuel economy. The Honda Civic with an automatic transmission get 30 city/40 highway so Honda is pretty danged close (until next year when the EPA shows the real fuel economy numbers) to kicking major arse. GM can do this if they wanted, but they don't seem to want to. As if to confirm my feelings for the car, a woman in a grocery store parking lot took time to regard the Fit and declared it "so cute." That's never happened to me in a Honda, either. "I'm going to wait for the 2008 Prius. They're saying it will get 110 mpg with a lithium-ion battery..."
Oh, sweet Jesus. We're ready! I smiled and waved goodbye. WHAT!? This is the ending? What are we supposed to do now. (reading bottle) "4 hours?!"